The game season is in full swing and at last, game is losing its reputation as a luxury food, eaten only in grand country houses. Snipe, wild duck, shovler, mallard, teal, widgeon, wood pigeon, partridge and woodcock are already in season. The pheasant season opens on 1st November to 31st January. Even if you don’t know a hunter, Marks and Spencer, as well as other supermarkets and farmers markets are beginning to sell game birds, one can experiment, escaping the tyranny of eternal chicken breast, farmed salmon and steak, the seemingly compulsory trinity of offerings on virtually every restaurant menu. Now that pheasant and venison, at least, are more readily available, let’s become more adventurous. There’s so many more ways to cook game other than roasting and many more exciting accompaniments than gravy and bread sauce, much as I love them both. Virtually every country has game so it’s worth checking out recipes from around the globe. Introduce other techniques, other flavours, and a variety of wild berries, spices, dried fruit, pickles and herbs. My favourite new book on game was written by Phil Vickery and Simon Boddy who wrote it with the express intention of introducing new ways to prepare cook and cure game. It’s like a total breath of fresh air and whereas they celebrate time-honoured traditions it’s choc full of new recipes you’ll really want to cook and lots of excellent general knowledge about different type of game – plucking, hanging seasons. The evocative photos are by Peter Cassidy. 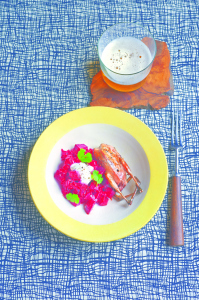 Here are a few recipes from “Game, New Ways to Prepare, Cook and Cure” by Phil Vickery and Simon Boddy courtesy of the publishers Kyle Cathie. Bees are under threat around the globe from a variety of diseases – colony collapse, the varoa mite….beekeepers tell me that the pollen from ivy flowers help keep the bees healthy throughout the winter months so resist the temptation to pull down the ivy, remember its’ beneficial for the bees. Using social and therapeutic horticulture to benefit people with learning disabilities….Thrive the UK’s leading charity are teaching a 2 day course on 2nd and 3rd November at the Cork Association for Autism. Phone Emma Hutchinson at the association 086 7888 241 or email horti@corkautism.ie for more information or http://www.eventbrite.ie/e/therapeutic-horticulture-course-tickets-18733647845 to book a place. On the face of it I know it sounds a bit weird adding condensed milk, but trust me it works. I picked up the idea when I was in America, and even using such a small amount really helps the flavour of the finished dish. To me, it’s no different than marinating chicken in yogurt to tenderise it. Frying pheasant would never have been entertained when I was a young chef, but I think it does the job of sealing in the juices of this very low-fat bird very well. Pour 1cm rapeseed oil into a frying pan and heat to roughly 175°C. Cut the pheasant breasts into 2cm cubes, removing any sinew from the fillet and inner breast. Combine the condensed milk with the water and eggs in a bowl and season well with the pepper, chilli powder and cumin. Beat together well. Dust the nuggets of pheasant with the cornflour, then drop into the egg mixture and coat well. Repeat the same process with the cornmeal or polenta ensuring the nuggets are coated well. While the oil is heating, mix all the ingredients for the dipping sauce together in a serving bowl, seasoning with salt and pepper. Serve hot with the dipping sauce separately. Pappardelle pasta is made for big, rich and delicious sauces like this. Once the meat is nicely browned, just simmer gently until you have a wonderfully coloured deep-flavoured sauce. Don’t rush it – just let it simmer away. It’s that simple! Heat the olive oil in a saucepan, add the onions and garlic and cook for 10 minutes until slightly browned. Add the mince and break up well with a wooden spoon. Then cook over a high heat for a few minutes, stirring well, until all the moisture has evaporated and the meat and veg are starting to brown well. Add the red wine or port and reduce right the way down until you have only about one-third of the original volume. Next, add the oregano, tomato purée, beef stock cube, stock, tomatoes and their juice and water, bring to a simmer and cook gently for 35–40 minutes. Serve spooned over the warm pappardelle. I know you’re thinking this sounds a bit odd, but trust me – it works. The balance here is between the saltiness of the dressing and the richness of the pink-cooked wild duck. Oddly enough, the intense fish flavour works well in this dish and has become a favourite of mine. It also goes well with roasted saddle of hare. Heat the olive oil in an ovenproof frying pan. Season the crowns inside and out with salt and pepper, then place skin side down in the hot oil and cook for 2–3 minutes until they start to colour. Transfer the pan to the oven and cook for 8 minutes. Meanwhile, put the anchovies, herbs, extra virgin olive oil, sugar and salt and pepper in a bowl and whisk together. Turn the duck skin side up and cook for a further 4–5 minutes. Remove the pan from the oven, cover loosely with foil and leave to rest in a warm place for at least 15 minutes. Add the rocket to the anchovy dressing and mix well with the water. Cook the broccoli in a saucepan of salted boiling water until just tender. Drain well and keep warm. Arrange the warm broccoli evenly on four plates and sprinkle with the radishes. Carefully slice down either side of the breastbone to remove the four breasts from the crowns and then slice each breast at an angle. Dab the cut duck meat on a piece of kitchen towel to remove any excess blood. Lay the duck meat over and under the broccoli, then spoon over the dressing. The raspberries must be very ripe and full of flavour for this dish to work successfully. The pickle is a very light one, and the berries are perfect to eat after just a few hours. 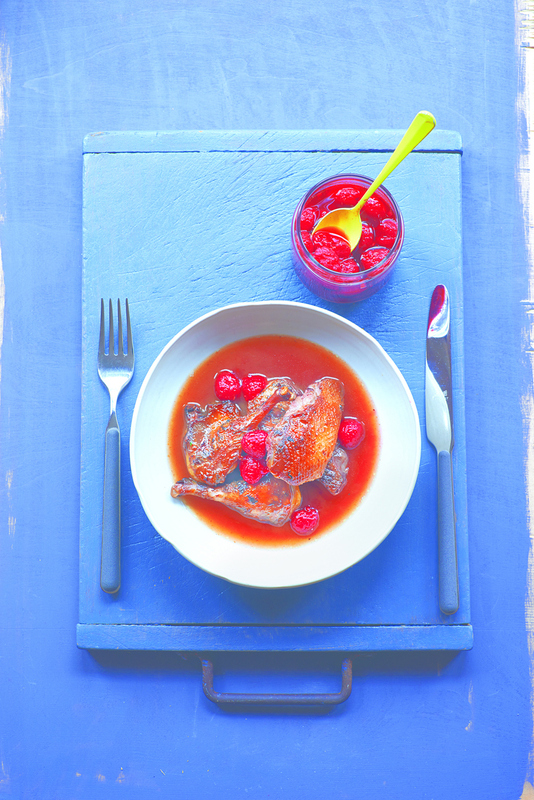 Adding a touch of raspberry liqueur to the finished sauce gives it a sweet, fruity edge that goes perfectly with the teal. Put the raspberries into a small ceramic bowl or glass preserving jar. Put all the other ingredients into a stainless steel saucepan and bring to the boil, then reduce the heat and simmer for 2 minutes. raspberries and leave to cool to room temperature. Serve after an hour or two or pop in the fridge where they will keep for a week or so but will lose a little colour. When ready to cook, preheat the oven to 230°C/450°F/Gas 8. Heat the oil in a large ovenproof frying pan. Season the teal well inside and out, then place breast side down in the hot oil and cook for 2–3 minutes until well sealed, ensuring that both breasts are nicely coloured. Turn the birds over so that they are sitting on their backs and transfer the pan to the oven for 10 minutes. overcooked – the breast meat should still be slightly soft when lightly pressed. Remove the pan from the oven and transfer the birds to a warm tray, turning them back onto their breasts. Loosely cover with foil and leave to rest in a warm place for at least 10 minutes. Transfer the birds to a chopping board. Using a sharp knife, slice through the skin where the leg is attached to the breast, then pull the leg back on itself so that the ball and socket joint pops open and carefully pull the leg away. Carefully slice down one side of the breastbone, continuing to cut right along to the wing, then cut through the wing joint. Tease the flesh away from the crown and gently pull the breast meat away. Repeat on the other side. Cover the legs and breast meat with foil and keep warm while you repeat with the other three birds. Place the frying pan back on the stove and add the shallots, garlic, celery and star anise, if using. Chop up the carcasses into small pieces, add to the frying pan and cook over a fairly high heat for about 10 minutes until the bones and veg have taken on some colour. Add the vinegar and boil rapidly over a high heat until almost all evaporated. Add the wine and boil, scraping off all the lovely caught bits from the pan. Pour the contents of the frying pan into a small saucepan, add the stock and bring to the boil, then reduce the heat, skim and simmer for 10 minutes. When ready to serve, strain the stock, season well with salt and pepper and add the sugar. It should be well reduced by now. Add the butter with the framboise and swirl in to give the sauce a nice shine. Place the roasted teal (you may have to flash it through the hot oven) in a hot serving bowl and pour over the well-reduced sauce. 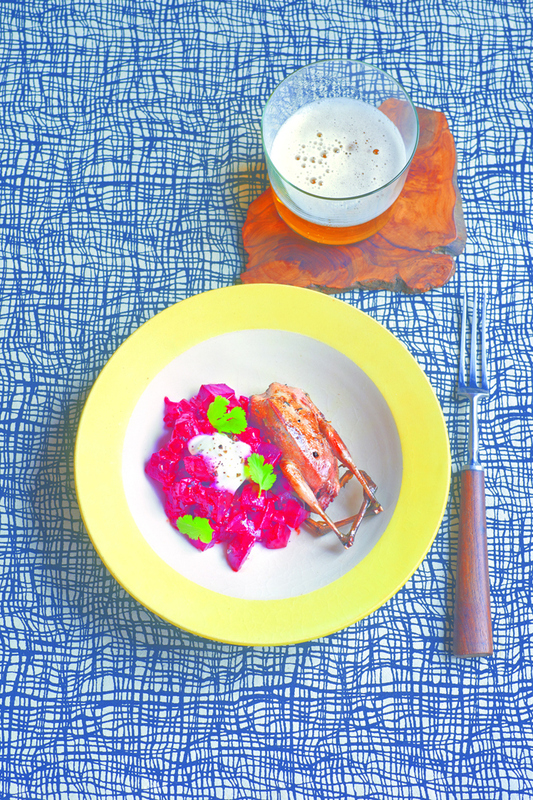 Serve with the pickled raspberries. curry spices and crème fraîche. Forget the knife and fork and pick the birds up to eat – all you need is a bib. take on a little colour on the edges. or until reduced to roughly half the original volume. the beets nicely but not too thick. Check the seasoning and adjust if needed. Heat the oil in an ovenproof frying pan. oil, transfer to the oven and cook for 5 minutes. other side and return to the oven for a further 5 minutes. a warm place for 10 minutes. Gently reheat the beetroot curry, trying not to break the beets up too much. through. Keep off the heat.